Monoi de tahiti oil is an ancient polynesian beauty secret. This unique beauty product is still made using the traditional, century-old Polynesia method in Tahiti. Two special ingredients make up authentic formulas for tahitian monoi oil products. The marriage combination consists of the blend of refined coconut oil and the “Tiaré” flowers in a specific technique and with strict production guidelines followed. The specific Cocos nucifera palm coconuts used for monoi oil contains many additional vitamins and proteins than other types of trees that grow in other areas. Tight specifications ensure genuine ingredients have been used and high quality standards are kept. 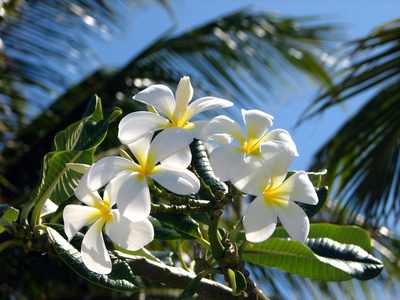 The Tahitian gardenia (Tiaré) is a star-shaped delicate snow-white petal flower native to Polynesia that blossoms all year long. This native flower is highly popular and used as a hair adornment over the ear by both men and women of Polynesia and also used extensively in leis and hei’. The tiare oil was used in traditional medicine for its soothing and healing properties, for many remedies such as easing ear aches, headaches, insect bites, and various inflammations such as eczema, and psoriasis. The very fragrant, floral aroma of the tiaré blossoms is the key ingredient used in the preparation of Monoi de Tahiti oil. According to the specific standards that are set and carefully monitored, the hand-picked, un-opened flowers (at least 10), are carefully placed in refined coconut oil to soak for a duration of at least 15 days while they go through a natural extraction process called "enfleurage,” to slowly release their unique properties. The gorgeous women of Tahiti are known for their satin-smooth skin. The century old beauty secret is said to be from monoi oil’ special properties. Coconut oil is renowned for its nourishing and high moisturizing properties. The secret blend of this high quality oil creates a non greasy moisturizer that quickly penetrates the epidermis layer to hydrate, lock in moisture, and soften the skin. It also forms a protective barrier to guard against many environmental aggressions and help fight the signs of premature aging. Thanks to its high hydrating properties, immediate rejuvenating results can be witnessed the very first time you use this amazing oil treatment. Its great emollient qualities, make it an ideal massage oil for a relaxing or therapeutic treatment. For individuals who suffer from dry itchy skin it can be very beneficial. Adding this oil to your bath can help soothe or it can be applied to moist skin after a shower. It penetrates quickly leaving a “soft to the touch” feel, a soft glow, and an exotic tropical smell. The Tahitian women's lush, long hair is world famous. 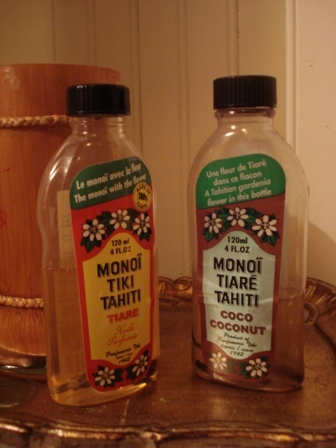 Many people owe the credit to Monoi tiare tahiti oil for “drop dead” gorgeous hair! Monoi’ conditioning benefits can tame or restore a shine to dry frizzy hair types or help repair badly damaged hair problems from color, relaxers, or heat breakage. Unhealthy, distressed hair lacks moisture. To help prevent or reverse damage to hair, lightly distribute a few drops through fragile strands or brittle ends. To help strengthen hair, use the Monoi oil as a deep conditioner treatment mask. Monoi Tip: Monoi oil solidifies at temperatures below 68 degrees F. To restore to a liquid form, set oil in the sun, warm in your hands, or hold the container under hot water. Always look for the Appellation d'Origine logo when selecting a Monoï de Tahiti product to ensure its authenticity and quality.